Gary Hamilton - League Cup exit a blow. 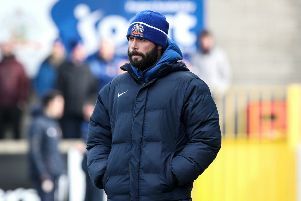 Gary Hamilton admits Glenavon’s League Cup exit is a painful blow to the club. The Lurgan Blues bowed out 3-2 on penalties against Annagh United on Tuesday night after looking well on their way into the next round. The match ended 3-3 in normal time but with ten minutes to go the Lurgan Blues were 3-1 up and heading into the next round until they went to sleep for two corners and suddenly Annagh were in the ascendancy. “We were 3-1 up and really should have seen it out,” said Hamilton. “To score three goals at home against a team from a league below us and end up out of the cup is simply not good enough. “I thought we played well in the first half, came back from conceding an early goal to lead 2-1 and really dominated the game. We came out in the second half and after getting the third goal we seemed to think it was over and all too easy. We had the possession but did nothing with it in the final third and as a result we made it easy for them to remain in the tie. “We took Kevin Braniff off with 20 minutes to go because he has been suffering from a slight groin strain but in the end poor defending from two set pieces was our downfall. In modern football set pieces are crucial and can change games as we have seen at all levels. We didn’t learn from the first when they pulled it back to 3-2 and then conceding again a few minutes later. “Once it went to penalties it is always a lottery but we should not have got to that stage. The stats show Annagh had four shots on target and scored three - we had 17 and scored three. “It is very disappointing because it is in the cups we want to go as far as possible - the cups are our best chance of silverware but once again we have failed to beat a team from a lower league which is happening too often.